მოძრაობა KAR.GE-სათვის უდიდესი პატივია “KAR.GE საექსპორტო კატალოგი 2017” – პირველი ქართულ-ინგლისურენოვანი ბეჭდური და ელექტრონული ვერსიების გამოცემა, რომელშიც 54 რჩეული ქართული კომპანიის 65 ბრენდი და 389 ნაწარმია თავმოყრილი ფოტოებით, აღწერებით და საკონტაქტო ინფორმაციით. ეს მოკრძალებული, მაგრამ უაღრესად საპასუხისმგებლო ნაბიჯია, რომელიც ხარისხიანი ქართული ნაწარმის ცნობადობის, გაყიდვების და ექსპორტის ზრდას ისახავს მიზნად. ჩამოტვირთეთ, დაათვალიერეთ საექსპორტო კატალოგი და FB მეგობრებსაც გაუზიარეთ ეს გვერდი, რომ რაც შეიძლება მეტმა ადამიანმა ნახოს თუ რა იწარმოება ხარისხიანი საქართველოში. მადლობა თქვენ! 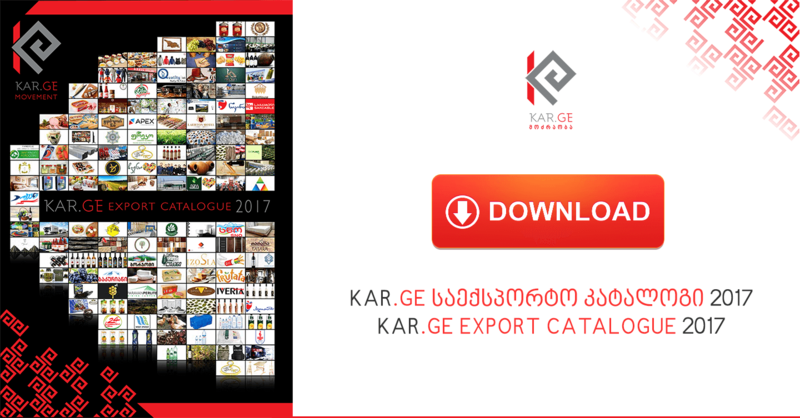 On behalf of KAR.GE Movement it is a great honor to present the “KAR.GE Export Catalogue 2017” – the first Georgian-English Print and electronic publications, with 54 selected Georgian companies, their 65 brands and 389 products all with photos, short descriptions and contact information. This is a modest, but a very responsible step in the way of serving the mission of raising the awareness, sales and exports of quality Georgian products. Download, take a look over the catalogue and share this page to your FB friends. Let them know & see see what are the quality products produced in Georgia that they can export. Thank you!